I missed a "finish" last month, so Sandi leads the parade this month. I'm so sorry, Sandi! And PS, I love the "Cupid" prezzie! The first of eight clues was released on Black Friday, November 29, 2014. I haven't missed this annual gift from Bonnie Hunter since I started in 2008. 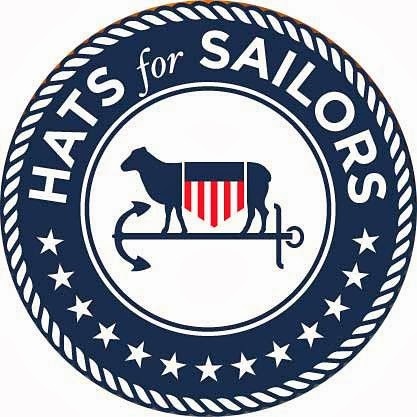 The pattern will be FREE on her website until sometime in the Spring of 2015. Click here to read about "Kadabra" on Sandi's blog, KwiltnKats. 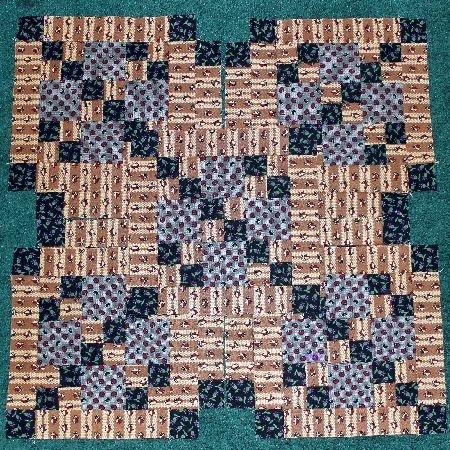 Here is Sandi's March finish, "Kurry," a design by Judy Niemeyer that she calls Briar Patch. Read all about it at Sandi's blog, KwiltnKats. 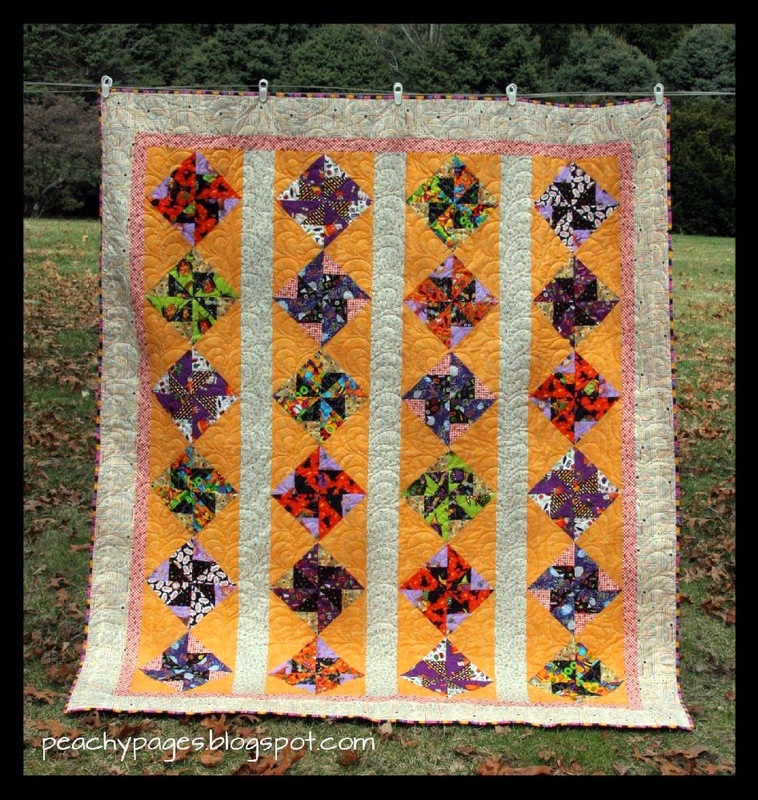 I love my version of Bonnie Hunter's design Dancing Nine-Patch! 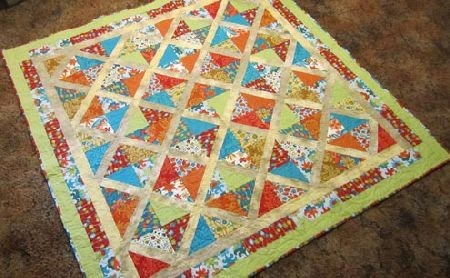 This is one of the FREE patterns she offers on her website quiltville.com. I found that I needed more 9-patches than the instructions called for to make the illustrated finished project. It all worked out fine in the end because mine was all made from scraps. Many of my 9-patches were already made or started. The inner border (the one in darker blue) is pretty skinny, but it looks perfect with the rest of the border setting. Read all about "Kabuki" on Sandi's blog, here. I've decided this pattern will be my new "leaders and enders" project, Sandi! My finished UFO’s for March is the little quilt hanging above my sofa. 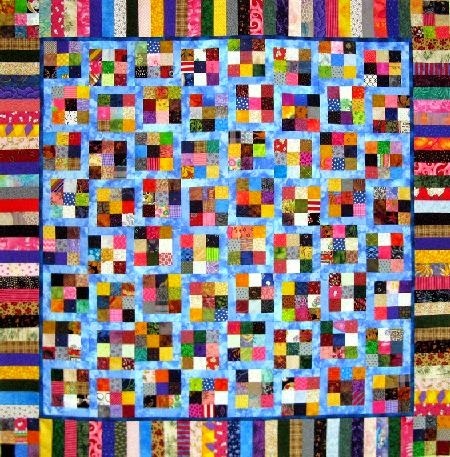 I made 2 of these Lynette Anderson quilts, in different colour schemes, one for me and one for Mum. I got hers quilted and bound and presented it to her at Christmas. But after all those hours of embroidery I lost the “oomph” to get mine finished. 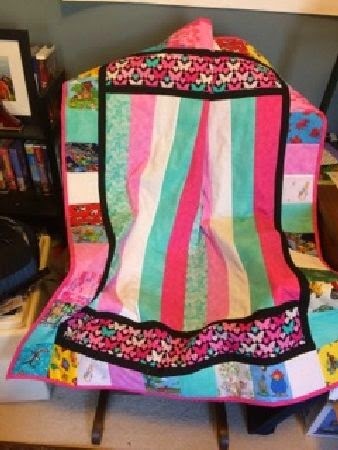 Then I signed up to your UFO challenge, bagged them up and really worked hard on this one to get it finished and on display in my sitting room, where I have a lightweight hanging pole, so I can switch my small quilts round when I fancy a change! The little heart was from a tutorial on the internet, which I bookmarked, but only just got round to putting together! 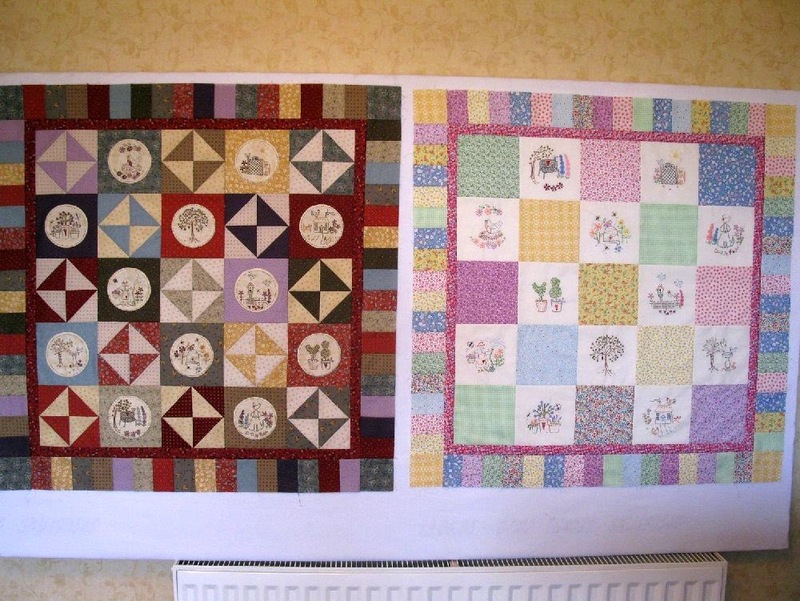 The quilt on the left is Kath's; the one on the right is her Mum's. Click on the photo to see the embroidery! 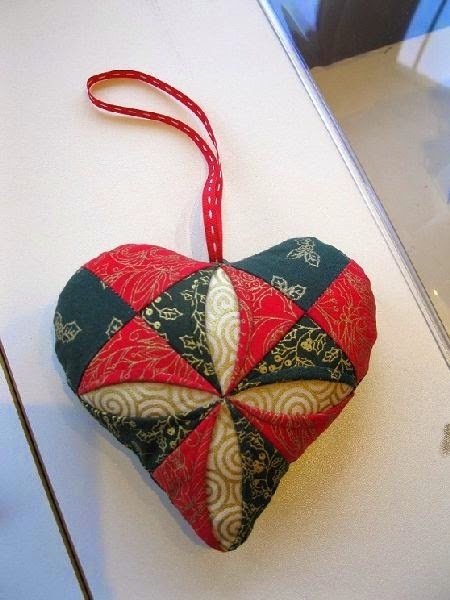 And here is the sweet Christmas heart -- I think that's the Cathedral Window technique. Hi Marti, here's my entry for the March UFO Parade. 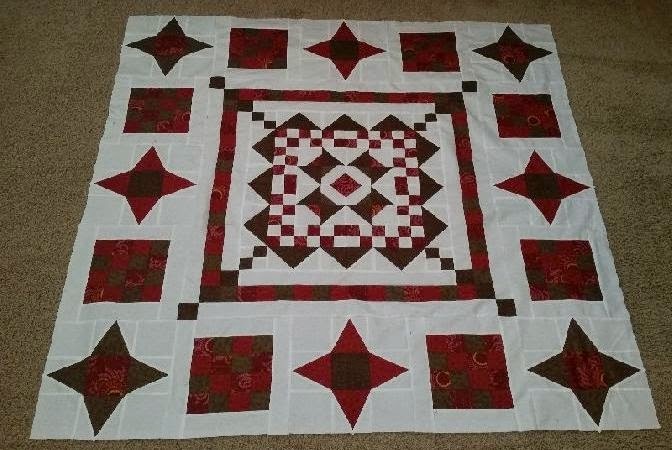 This was supposed to be a Christmas 2014 project; I had it sewn, sandwiched and quilted by Dec 7, but then it just sat, needing only to be squared up and the binding attached. The youngest grand-daughter and I finished it today, including taking some outdoor beauty shots. The blog post, including more pics, is at Yarn Tails, here. 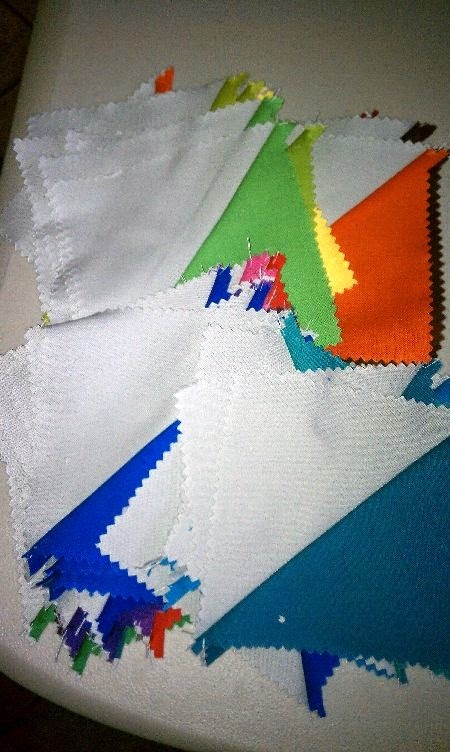 Jennifer's goal was to "finish" all the HSTs she needed for her chevron quilt. Here they are! 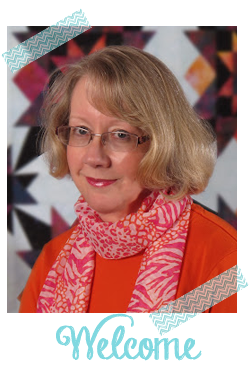 Looking forward to seeing your quilt, Jennifer! Debra finished the fourth "Grand Illusion" mystery for this year's UFO Parade. 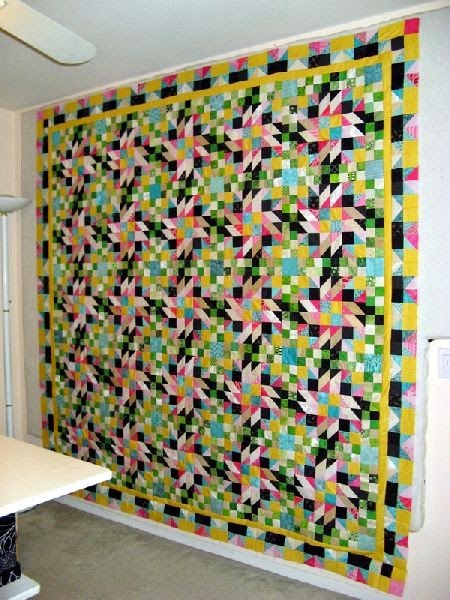 I need to get mine to the quilter so I can show it off! 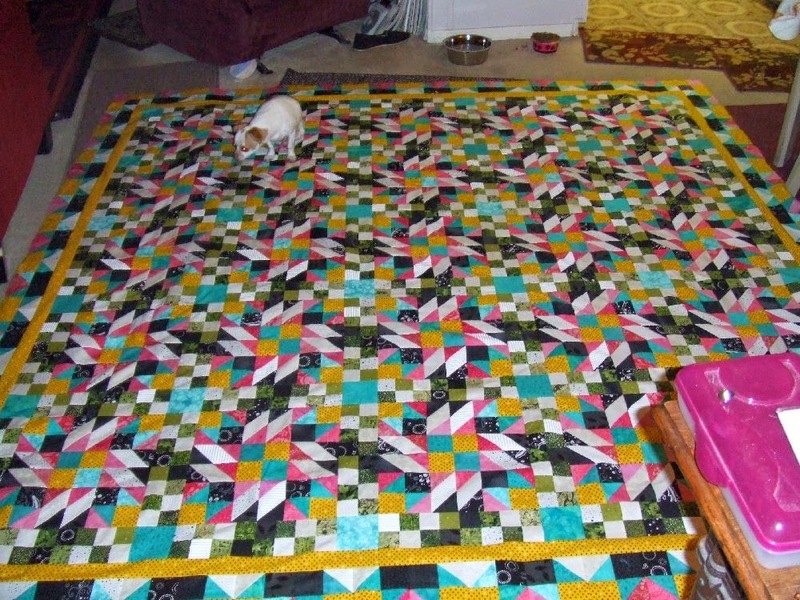 This quilt is so big, it's impossible to get the entire thing in the photo. Love the visitor, Deb! I love Debra's "Bunny Trails," and the story behind it is even better. Another one bites the dust and it's Bunny Trail time. A few friends and I started this Buggy Barn project quite sometime ago and I have finally gotten around to finish mine (Debbie Allen and Sandi Delman (kwiltnkats.com) were done last year). 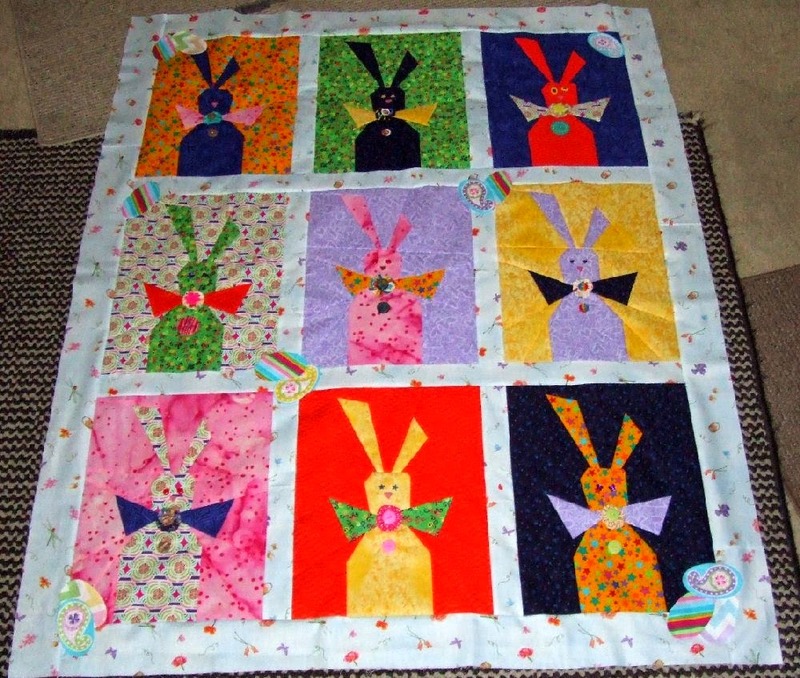 It is called Bunny Trail and is a Buggy Barn pattern. The workshop was taken at Paradise Sewing in Poway and Julanne Bergstrom (the BEST Buggy Barn instructor around) had great patience with me while working on this project. 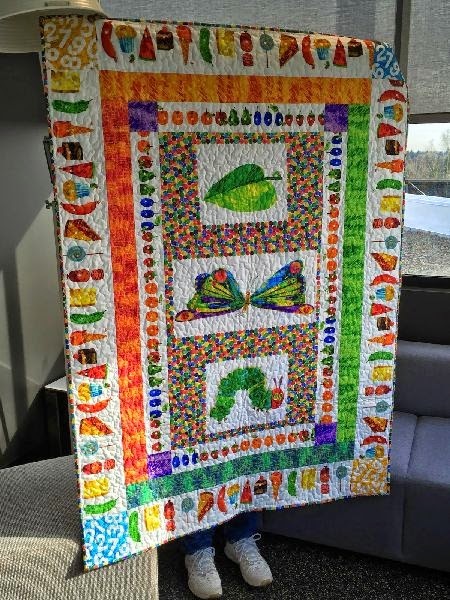 If you haven't had the experience of taking a Buggy Barn workshop - it's time to do so - they have a "quilt mindset" all of their own. hehehehheheeh Enjoy and it is finished just at the right time - Easter Bunny Time. Happy Easter everyone. 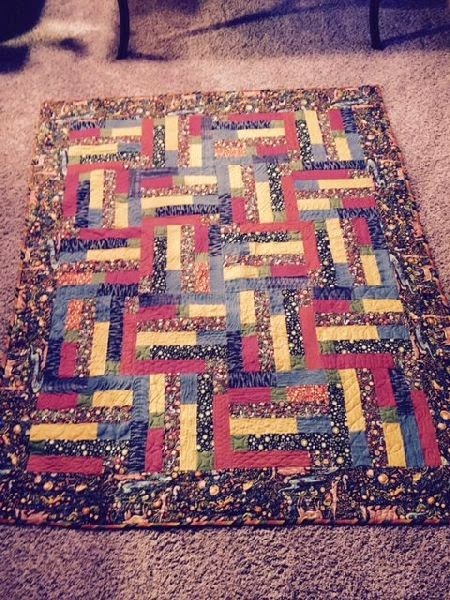 You are so lucky to have such good "quilting buddies" close by, Debra! Another one for my "wish list!" This would be a great Scrappy Sunday project! How cute is Donna's March finish? 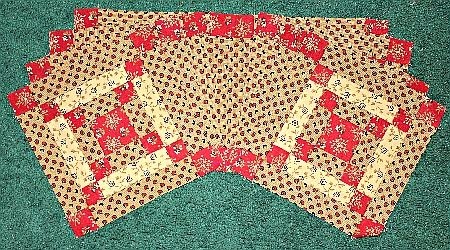 Looking closely at the photo, it looks as though you might have used a technique similar to Jean's Genius Binding. did you? A different Donna finished her "A Quilt Block a Day" quilt from last spring. I love this quilt with solid colors and white! And another finish this month! 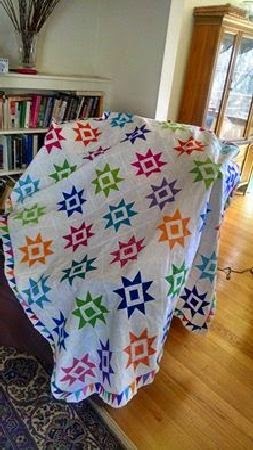 Can't really see the "quilt" in this photo (it's two layers of batik, the baby lives in Hawai'i where they complain when the temperature falls to 65 degrees!). But with this cutie lying on it, who cares about the quilt? 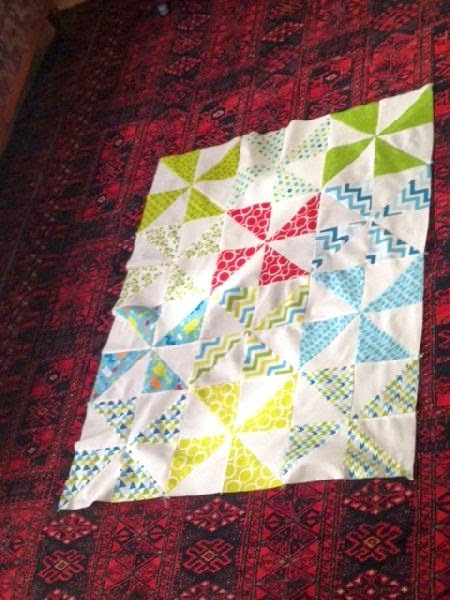 Idaho Martha sent a photo of the "easiest baby quilt ever!" 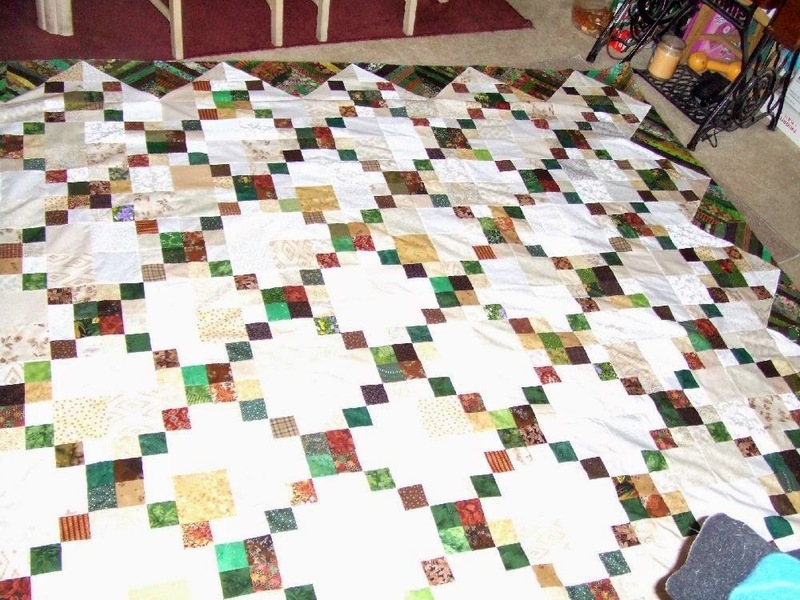 Put a solid and a patterned 10" square (right sides facing in) and see all around the four sides. Cut an x from corner to corner. Rearrange and sew together. This is going to Maryland. Note: from one pack each of a solid and a patterned layer cake you can get three baby quilts! 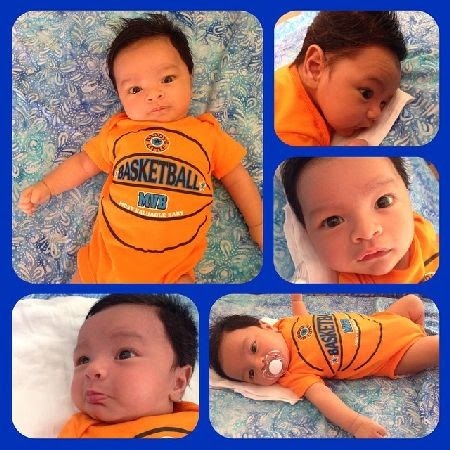 Cute cute cute! Have we done pinwheels for A Quilt Block a Day? This would be a great design! I finally have a finish to share this month - although not one of my original UFOs. I learned that a friend had been diagnosed with breast cancer and I wanted to do something to acknowledge the situation, but be positive at the same time. She is also a retired elementary school librarian so I used my literary fabric in the border. She can play an “I spy” game with her grandson this way. Then she can wrap up in the hugs being sent her way. I used the pocket on the back to put a list of the things to look for in the quilt. Surely a blessing for your friend, Irene. Kerry has two "big" finishes this month. First up is Scrap Crystals, a Bonnie Hunter pattern from her new book. It was started in a workshop in October 2014. Next up is the Downton Abbey Mystery Quilt that Kerry started in a Mystery class at Road to California Quilt show in January. Kerry, you really make me want to drop everything and finish my own Downton Abbey Mystery! Reyna finished this gorgeous Judy Neimeyer wall hanging, Winter Wonderland. She calls it "Snowstar." You can read more about it on Reyna's blog, Yarn In, Yarn Out. Heather-of-Peachy-Pages' finish is so fun! Between her and Martha, I am really set on making pinwheels for the next "A Quilt Block a Day!" 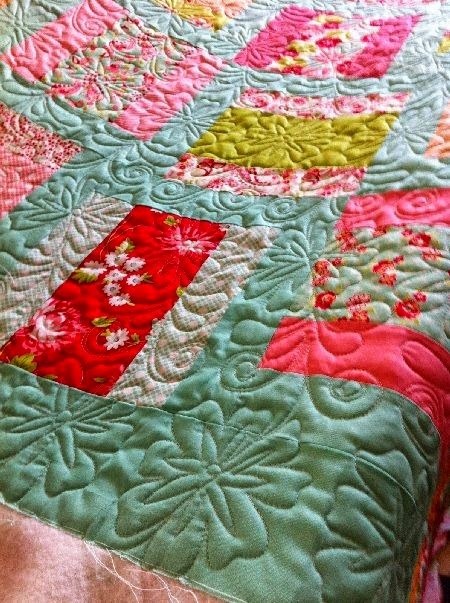 Be sure to go to her blog, Peachy Pages, to see the blocks up close! 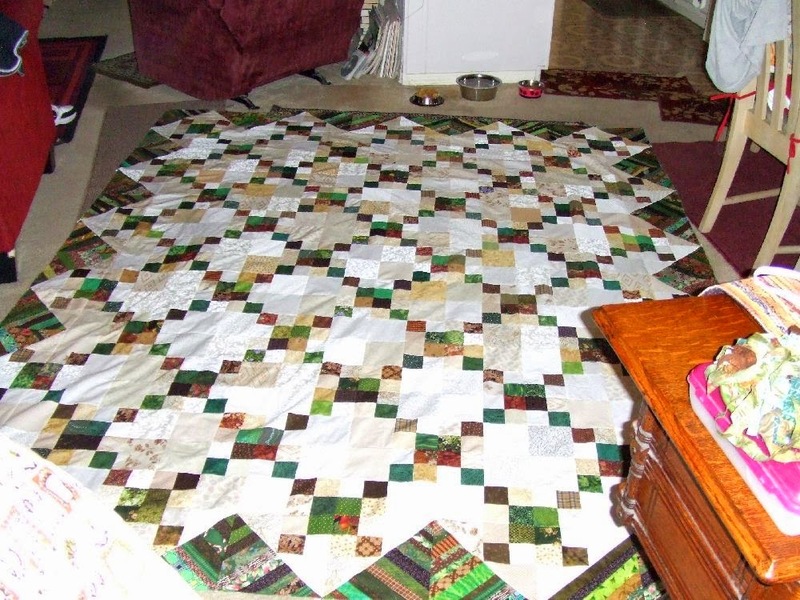 Gloriajean finished a carefully "aged" quilt this month. She says she has had this fabric for four years, "just waiting." The March finish turned into a March DONE with this one! 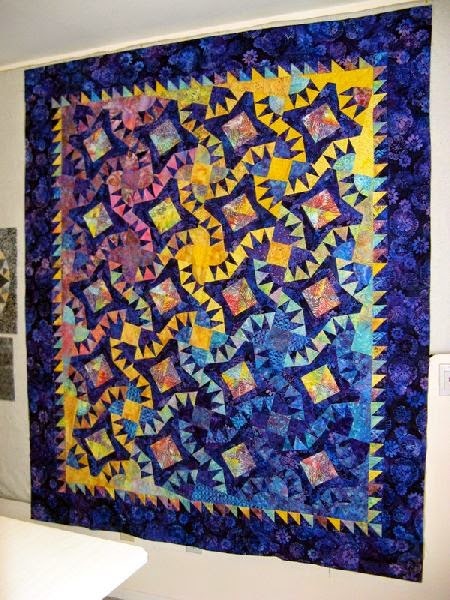 I bought a paper piecing pattern for Storm at Sea in 2006 and carefully cut the pieces out of scraps between projects. Alas, I did not follow my own advice to make a sample block before committing to the whole thing! When I pieced it carefully following the lines on the paper, all the points were cut off!!!! The whole thing went in the trash and roughly 2000 carefully cut pieces are now to be "repurposed". Read about this sad story at Mary's blog, Zippy Quilts, here. Mary, this is when you throw the blocks on the ground and drive over it with your car as many times as it takes to make you feel better! Becky has the right attitude. I finally finished the top for my heart quilt! Yay!! 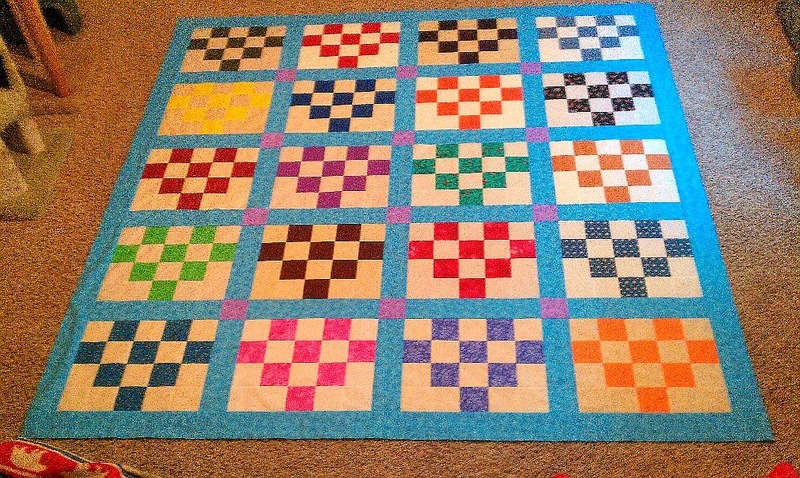 The pattern is from a kid's quilt in "Quilted with Love: The Project Linus Story," but I had the idea in my head that biggie sizing the blocks would make a great bed quilt. I made the first block about a year ago, but then my enthusiasm bubble burst when not many of my friends could see the hearts without prompting. I finally decided, "Who cares! It's my quilt and I'm going to finish it!" Tada! Becky, *I* can see the hearts! Hey, wait a minute, Nancy! 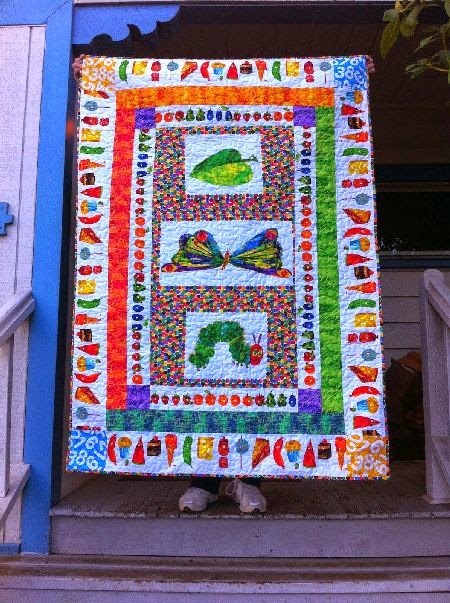 I thought you said you were finished with making "Very Hungry Caterpillar" quilts. Here are two more -- and I still love them! I thought I would save this photo until next month, when Nancy has the quilt bound. 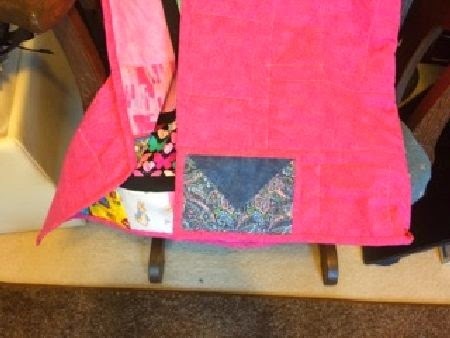 But I really want you all to see the close-up of the quilting her daughter did! And here is one of those "long-time UFOs." Nancy says it has been kicking around the sewing room for quite awhile, always being moved from one place to another! Donna's story about her March finish really made me laugh! 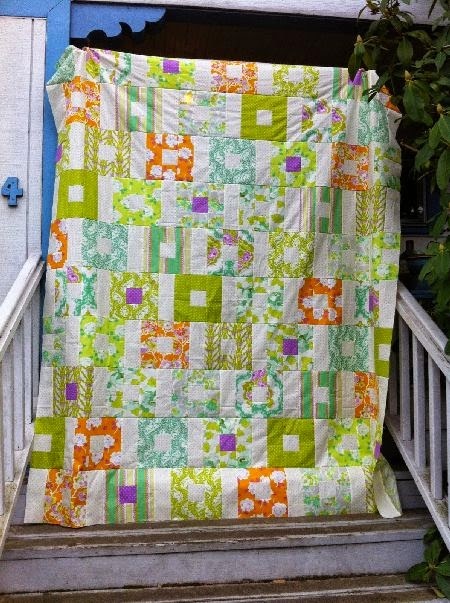 She reports she started this quilt about six years ago -- good thing fabric doesn't spoil, isn't it? 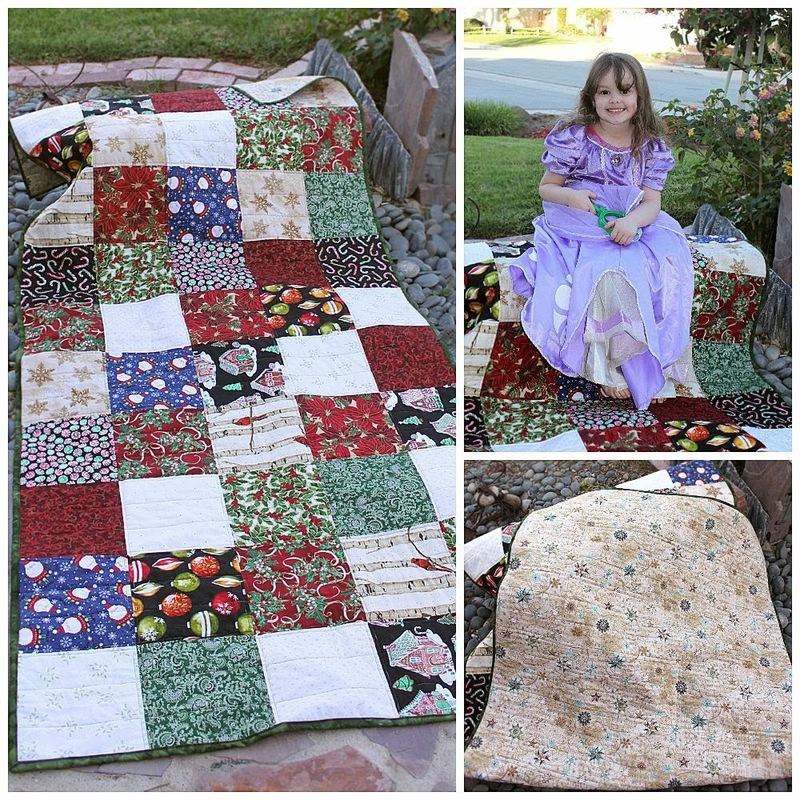 You really must go to Donna's blog, quiltpaintcreate, to read the rest of the story! 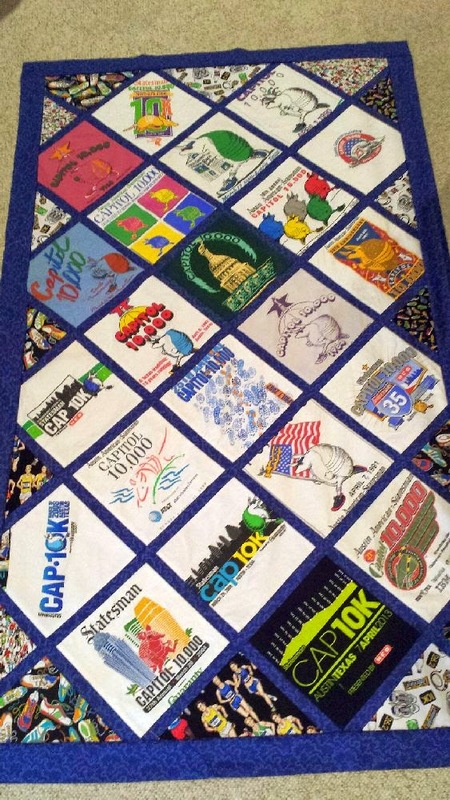 Betsy send in this t-shirt quilt she made for her Dad. Love the story behind this one! T-shirt quilt for my dad, made of shirts from Austin's Capitol 10,000 race. He's done it over 30 of the 37 times they have had it, including the very first one. He'll be lacing up his running shoes for this year's race in a few weeks--rocking the 80-84 age group!!! I have a very special finish to share with you all to close out our UFO Parade. This is a friend's daughter, age 9. Zoey picked out these charms squares at the Rocky Mountain Quilt Show last fall. On the way home, she and her mother stopped at Cotton Candy Sewing Shop in Loveland and Zoey fell in love with this pattern. So... She got to buy more fabric. She had a little help doing straight seams... But she ran the pedal all by herself. Great job, Zoey! And thanks, Angela, for sharing the photo! I think no one will object if Zoey is the winner of this month's UFO Parade, do you? Congratulations on your first finish, Zoey, and I'll be mailing you some goodies this week! I have some great knitting finishes to share tomorrow. Wow! A lot of finished this month! Unfortunately I did not finish 3 last month. 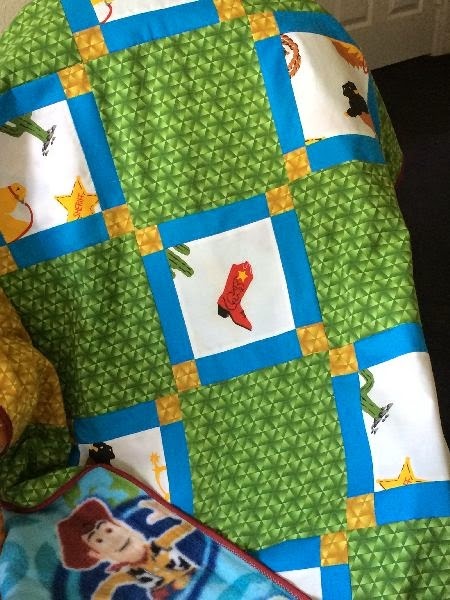 The Toy Story quilt is really cute, but not mine. Thanks, Donna, I corrected the post to give credit where credit is due! Thanks for this help to get finished. I´m a bit late, but my Februaryquilt is finished and my Marsh will be so soon. Late, but finished. !! Love to see all the nice quilts here. Great parade!! Everyone did an outstanding job, and congrats to Zoey for her finish. Welcome to the Quilt Bug Club! 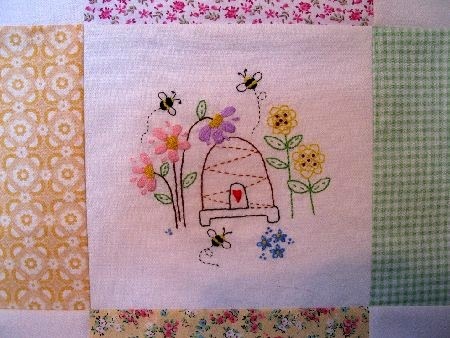 They are all very impressive, but my faves this month are Kath's Embroidery and Donna's Spring Quilt Block A Day. Beautiful work, Kath, and what a blessing for Mum. And I love the colors in Donna's. The white just makes it "Pop", and the bright stars just make me happy! Thanks Aunt Marti for hosting another exceptional parade! Thankyou Joy, how kind of you. She was very pleased with it and displays it on the back of her sofa. So many fun finishes and so many great ideas! 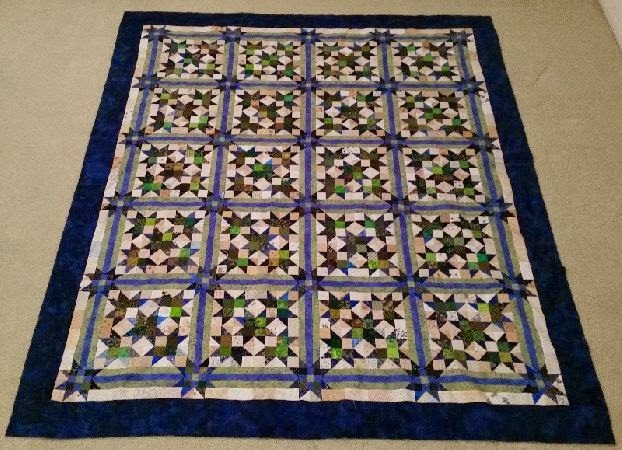 Seeing Donna's QBaD star quilt makes me want to pull mine out and get going on it again. I love Kerry's Scrap Crystals, that's one of my favorite Bonnie Hunter patterns. I might have to borrow Irene's idea of putting a pocket on the back of I Spy quilts. 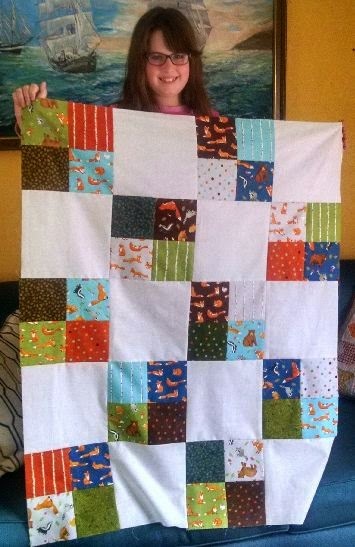 And the quilting Donna chose for her 6-years-in-the-making quilt would be perfect on a similar quilt I have in mind. Thanks for another great parade! I love all the quilts and seeing that darling little baby! Wow, hasn't everyone been busy this month. Sadly my March project didn't get finished but I did make a lot of progress so hopefully I can get it finished some time this year. Well done everyone. Wow I thought I was busy. that is a lot of finished projects. I still what to make the Grand Illusion. But I keep saying that I must finish some I have before I start more. We will see if I can stick with that. Congratulations to everyone who finished something - my life seems to be full of "new projects"!! Absolutely the prize goes to Zoey - we need to encourage young people.